The Art and Artifacts of Newark pop up store, located at 233 Washington Street, will be having its opening reception on Saturday, April 1st from 6 to 8pm. Anker will be the first featured artist of this gallery/store! 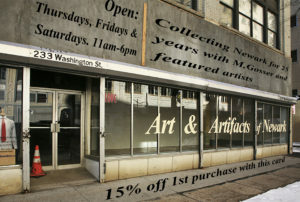 Art and Artifacts of Newark is affiliated with Index Art Gallery, which occupies the second level of the building.